Watch out, world. I got a Vitamix for my birthday. Yancey coordinated with all our family members to go in on it. Thank you, tribe! I keep joking that someday I won't ask for kitchen appliances for my birthday, but that day hasn't come yet. I will avoid devolving into an infomercial here, but it's true what they say about Vitamixes. They're amazing, and we're about to embark on the Summer of Pureeing. I love how no special prep is involved--nectarines with peel, whole oranges, half apples, a bit of juice concentrate from the freezer, a big handful of kale. I had briefly entertained asking for a juicer instead, but I'm glad I didn't. All that fiber, gone to waste! Of course I am doing the green smoothies (the kids love to gross out) and oodles of fruit. But I made this one for breakfast, and it satisfied that "I just did a good job by having some protein for breakfast" thing. In other news, I walked the Seattle Rock and Roll Half Marathon with my dear friend Molly, and they announced my name when I crossed the finish line. My first race, first medal of my life (everyone got one--don't get too excited), and it felt good. My favorite part was walking on the Alaskan Way Viaduct on a 75 degree day with no cars and looking out over Elliott Bay. I said to Molly, "I'm so glad we are here." And I was. And I threw a birthday party for myself, invited some incredible women, and basked in their wisdom, their love for me, and the miracle of another year of life. My spiritual director told me yesterday there was "more of me" in the room than she'd experienced before, and that's Grace. Gift after gift. 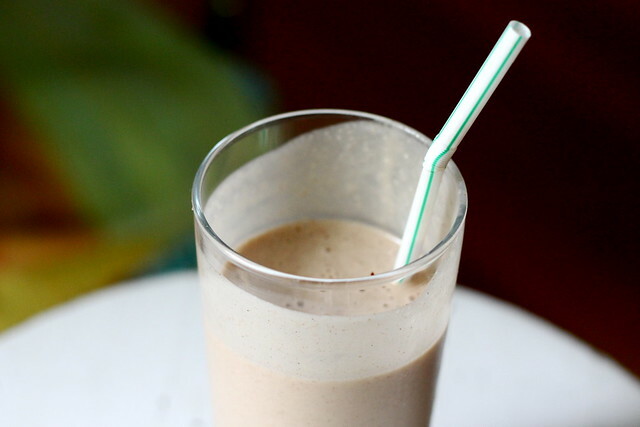 Get our your blender and throw in one frozen banana, 3/4 c. almond milk, 2 Tb. almond butter, 1 tsp. unsweetened cocoa powder, 1/4 c. old fashioned oats, and a dash of cinnamon. Blend until smooth.